The Lagoon 500 is a luxurious high-performance catamaran available for charter that is designed for ocean cruises that includes the innovative features. The L 500 was designed by Marc Van Peteghem and Vincent Lauriot Prevost, who have won a record number of awards for multiple-hulled boats (in 2004, boats they designed won the four first places in the famous English Transatlantic race), and benefits from the latest developments in naval architecture. Its speed and handling at sea promise to be outstanding. Very comfortable, spacious and luxury equipped. Comes with a top skipper, for best luxury catamaran experience in Greece. 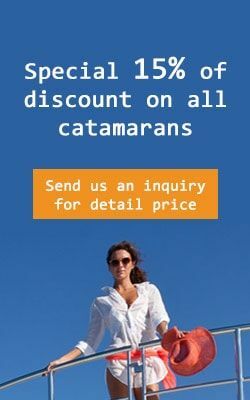 Charter catamaran Lagoon 500 for rent in Greece and let us catapult you away for an unforgettable charter journey along the Greece islands from Athens, Lavrion, Lefkada but soon from all bases in Greece. Available for catamaran Crewed with our professional crew this all new sailing yacht can be rented for one way charters to and from Athens to Mykonos as well as other famous islands subject to availability. Send us an Inquiry right now to secure top prime dates avoiding disappointment later or availability risks.